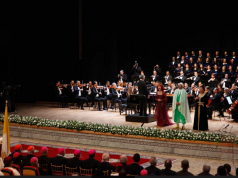 Rabat - The Kingdom of Morocco has always been a land of intercultural coexistence and tolerance. Rabat, its capital, hosts the places of worship of the three Abrahamic religions. Walid El AouniInline is a journalism student at ISIC. 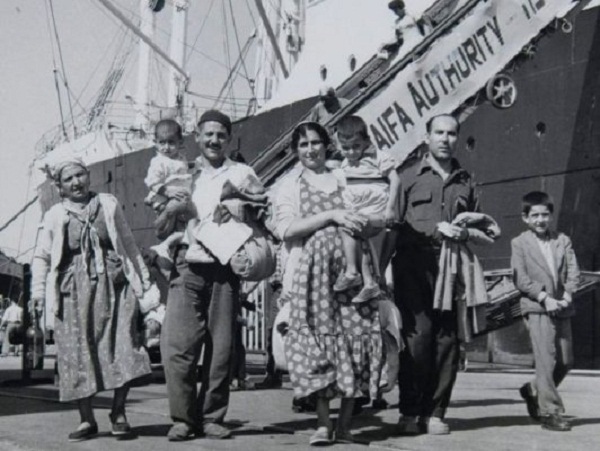 Rabat – The Kingdom of Morocco has always been a land of intercultural coexistence and tolerance. Rabat, its capital, hosts the places of worship of the three Abrahamic religions. 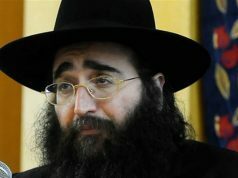 There, one finds mosques, churches and synagogues as rooted in time as the relation of fraternity and peaceful coexistence that binds Islam, Christianity and Judaism. Some of these places of worship date back to the colonization period in Morocco. During this period, Muslims, Jews, Christians and foreign colonists used to practice their religions each in their distinctive places of worship, located in different corners of the city. 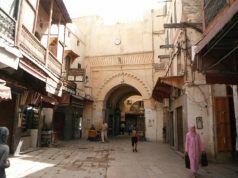 Jewish synagogues were mainly located at El Malah neighborhood, whereas Christian churches were located near the French Institute at Joulan square. Mosques, on the other h and, were already there, since Islam had always been the predominant religion in the kingdom. Today, these places of worship in Rabat are but emblems of the spirit of peaceful cohabitation and acceptance that marked the relations among the adherents of the three religions. All practice their religions without any hostility towards the different other. 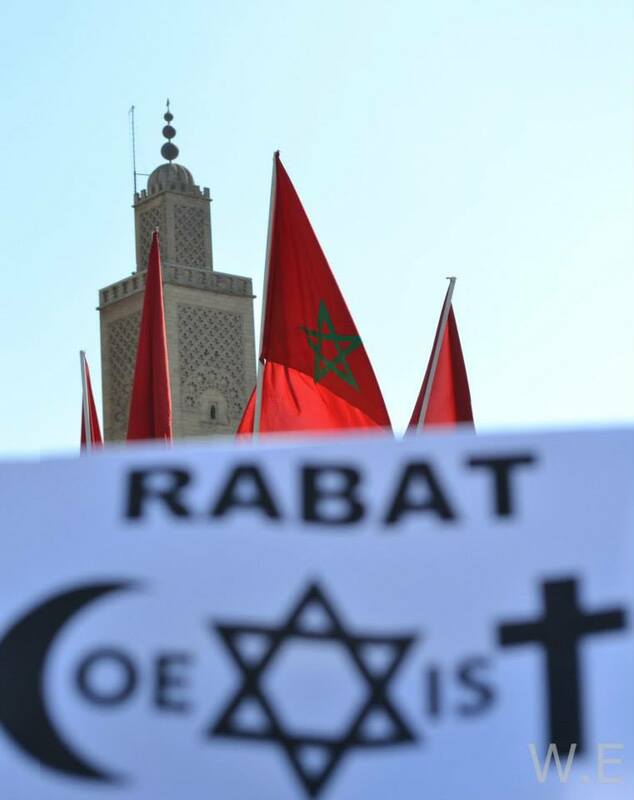 The photos below use religious iconography to demonstrate the peaceful co-existence between the three Abrahamic religions in Rabat. One way to do this is to see how the different symbols attributed to the three Abrahamic religions reflect the spirit of cohabitation when put together in different contexts. 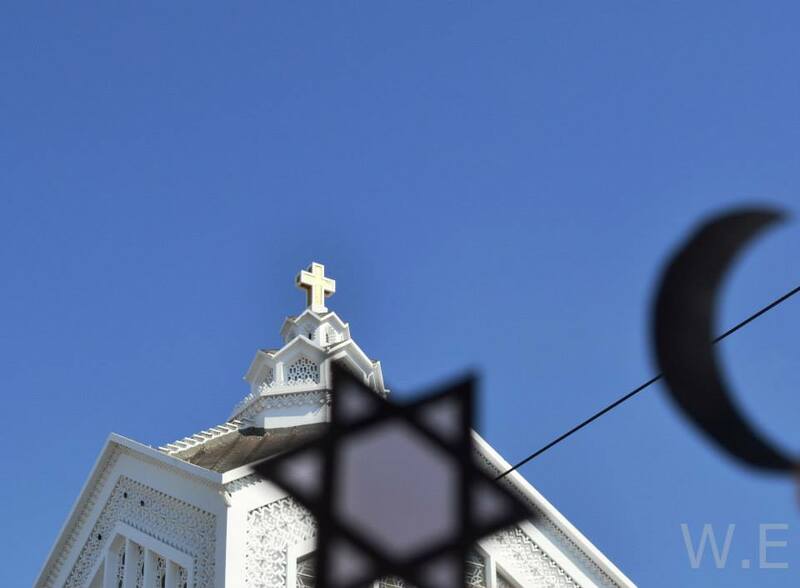 The Christian Cross, the Jewish Star of David and the Muslim Crescent and Misbaha co-symbolize the spirit of fraternity that binds the three religions they represent. Morocco’s flag wavers above the land where the three religions coexist. In the picture below, you can see the three symbols of each of the Abrahamic religions put together under the wavering Moroccan flags. 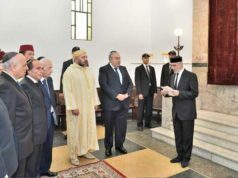 The picture symbolizes Morocco’s readiness to defend, by all means, the relationship of fraternity that has for so long united Islam, Judaism and Christianity together on this land. 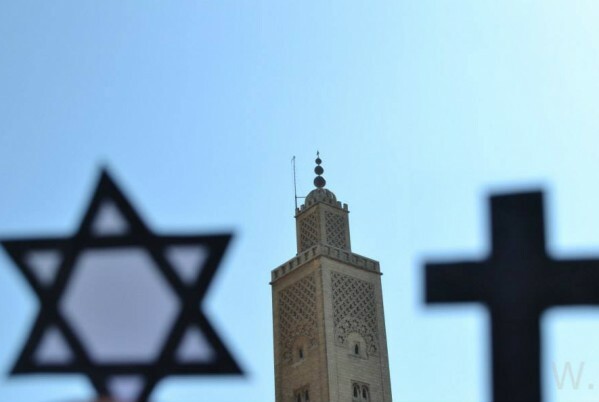 This picture symbolizes the religious coexistence that characterizes Rabat, through a synergy of the Suna Mosque, the Christian church and the hexagram, a generally recognized symbol of Judaism. 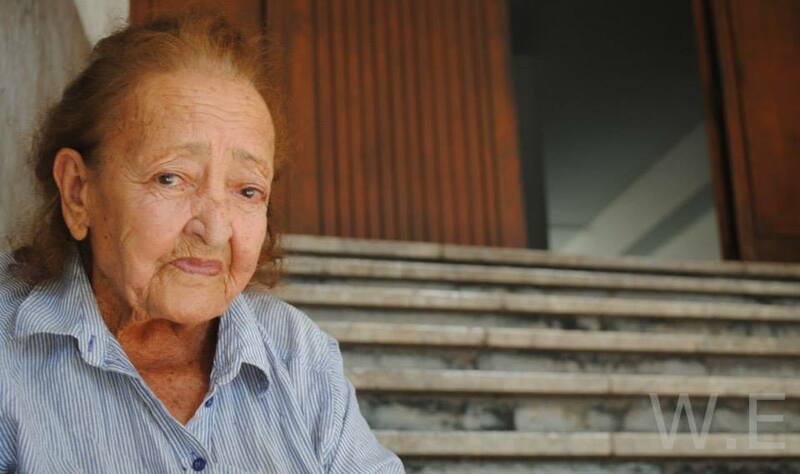 The picture below portrays an old Moroccan Jewish woman at the entrance of the Jewish synagogue located at Moulay Ismail Boulevard next to the El Malah neighborhood. 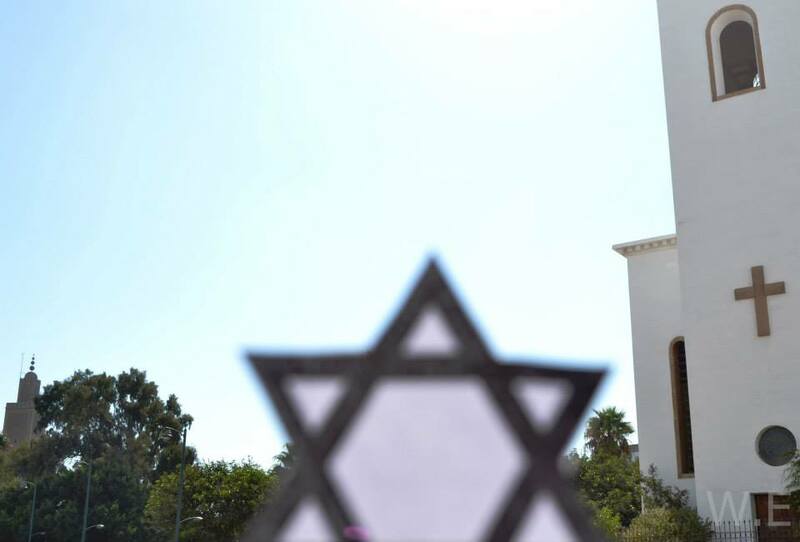 Easter lived 70 years of coexistence and peace with Moroccan Jews living in El Malah neighborhood. This is another picture reflecting the coexistence of the three Abrahamic religions in the capital. This picture features the internationally recognized symbol of peace along with the Muslim Misbaha, with the Christian church in the background. 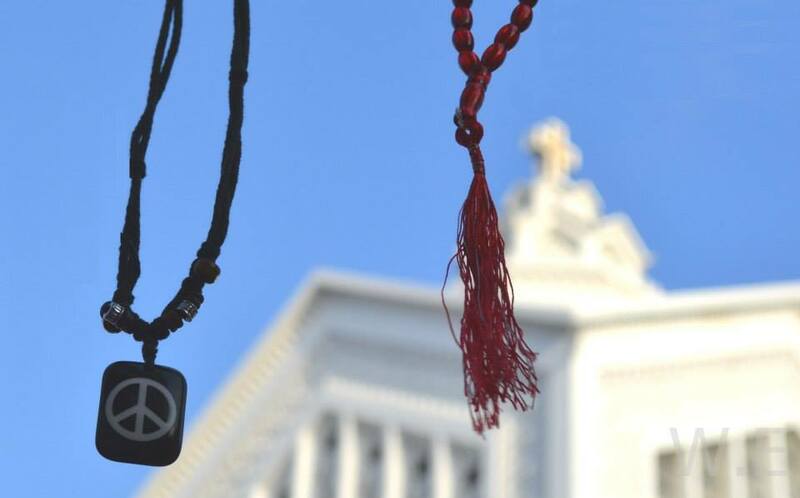 The three symbols of the Abrahamic religions featured together in one picture: a symbol of coexistence. 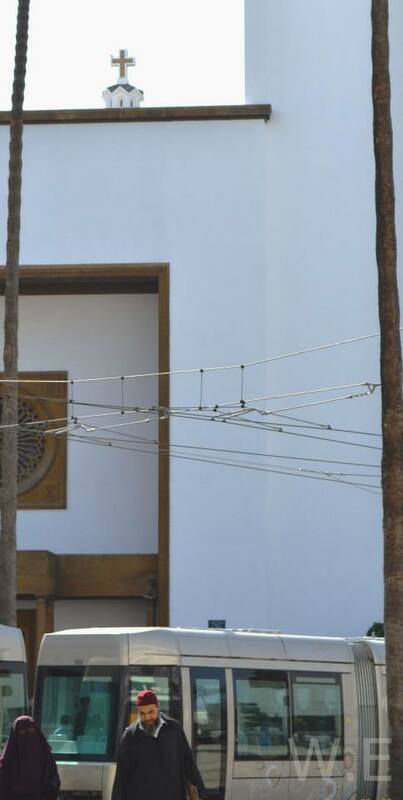 This picture symbolizes the religious cohabitation that characterizes Rabat the capital, as even what is called “conservative Islam” accepts to live peacefully in a society where other religions are practiced.